Drive west on the Pacific Coast Highway, 22 miles from Malibu to the La Jolla Canyon parking lot. As we drive along, the lazy Pacific surf noses in on our left. Up ahead Mugu Peak is still shaking the morning mist from its crest. La Jolla Canyon is east of Mugu Peak. Walk north from the parking lot at the Ray Miller Trailhead, going upstream on the La Jolla Canyon Trail. An old road, built in the 20's and used to haul rock for building the Pacific Coast Highway, goes about 3/4 mile into the canyon. We can see the quarry on the left as the trail starts up to the two waterfalls. Stop in the shade at the upper waterfall and notice the red roots of willow trees growing in the water. A rocky, steep, narrow segment of the trail lies ahead for a few hundred yards so we use an added amount of caution until the tread underfoot becomes wider. The waterfall is at an elevation of about 250', we level off after the two big switchbacks at an elevation of 500'. We will have gained one quarter of the entire hike's elevation in just a few minutes. At this temporary high point look at the sandstone along the trail -- look for a layer of fossil shells. Sedimentation embedded these shells in sand when the land was an ocean floor. Giant Coreopsis plants are in bloom during February through April. Come here then, if for no other reason. Continue along the trail for a few minutes and reach a side trail branching left. Maxine calls this the "Frying Pan Loop Trail." We have just done the handle and will spend the next hour and a half, doing the loop. Take the left trail and it immediately drops down to the stream in the shade of oaks before making a left turn to climb along the shoulder of the mountain. A viewing spot lets us look down on the trail we hiked earlier. We have an exceptional view of the ocean if it is a clear day. On the uphill side of the trail look for a Cholla cactus, a rarity in the Santa Monica Mountains. Our trail heads west toward the approach to Mugu Peak, then turns north for an uphill climb to La Jolla Valley. Our first view of the upper valley is an astonishing sight. We see a Valley Grassland plant community that we include in the inventory of California Natural Areas. It is one of the best existing relict stands of native California grassland, anywhere. Chumash Indians lived here for thousands of years, then it became part of a provisional Mexican land grant to Isabel Maria Yorba in 1836. Mexico awarded the grant of 30,594 acres, called Rancho Guadalasca, in 1846. In 1871 Isabel Yorba sold 22,000 acres of the Rancho to a land company that resold to William R. Broome in 1873. Under the Broome family, Rancho Guadalasca has functioned as a ranch into the present. 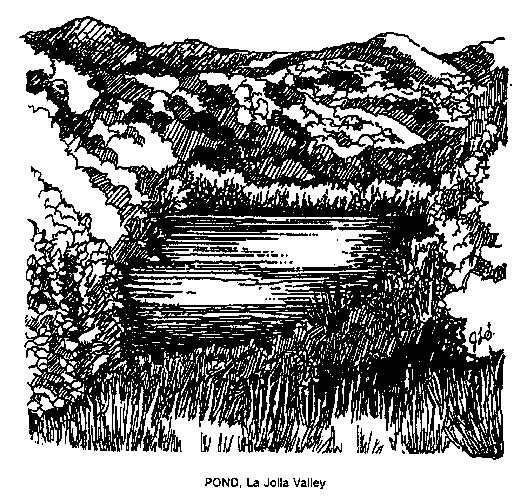 Part of the ranch, including La Jolla Valley, sold to the State of California in 1966 for recreational use. In February 1971 the State Park and Recreation Commission, renamed the land Port Mugu State Park, and adopted a pristine use plan. One of our favorite lunch spots is on a knoll east of the trail. We have a good view of the ocean and the vegetation recovery gives us a windbreak. Continue north on the trail and we are on the eastern edge of the grassland. Not all of the vegetation is native, we will recognize introduced grasses mixed with the natives, and in springtime might even taste the waist-high Mustard flowers. For the first ten seconds or so mustard flowers have a slightly sweet taste. Then hot! Our trail intersects a trail coming from a saddle on the western horizon north of Mugu Peak. Turn right and follow this trail until reaching a walk-in campground on the left. Restrooms, water, and shade under the oaks are available. If the sun was too hot to have lunch back along the trail, this is a good spot for eating. To return we walk about 150 yards back on the trail we came on, then turn left onto a narrow trail and stay left until we pass by the pond, then angle right and meet the main trail down into La Jolla Canyon. A brisk 45-minute walk takes us back to our cars.